I love making stuff happen. I’m an instigator, a collaborator, and a coordinator. I love saying and doing things that get people all fired up with inspiration, and then watching them as they jump in feet first and have huge adventures and successes. I’ll supply the energy as long as there is will and skill. So in January 2013 when I read a blog post by Burning Man blogger Caveat Magister wherein he posed the question “Why does Burning Man have no literary culture?”, among the various thoughts I had as a result of the article, the one that stuck was: “Hey, wouldn’t it be fun to help figure that out?” However, I am not totally crazy, and I’ve gone big at Burning Man before and been totally sapped of energy because of it, so I knew that I’d be taking too much on if I tackled Caveat’s question all by my lonesome. I am but one person, and a busy one at that, so in a largely unprecedented act of self-preservation I settled instead for creating a little writing workshop to bring to the playa. Then, a couple of weeks later as I was idly cruising Spark to see what projects people were up to, I found a post by someone looking for others who were interested in addressing Caveat’s blog post through a group they’d started called Get Lit(erary) at Burning Man and I thought, “Cool, a kindred spirit! I’m going to join this Get Lit group on Facebook and see what I can do to help out!” Couldn’t hurt to just join up and lend a hand as needed, right? Soon after I joined Get Lit I started chatting with Courtney (playa name What), the woman who had started the group and put that post up on Spark. We got excited because it was clear that both of us were really into the idea of making Get Lit work. We began reaching out to everyone who had responded to Caveat Magister’s post, and got a hold of Caveat Magister himself to let him know that we were out there in the world, working on answering his question. Next thing you know, What and I (my playa name is Wonton) were being interviewed by Caveat for the new blog post he was creating to let people know what we were doing. Then we got interviewed by Pamela Stewart for Ignite Me, and online magazine whose mission is to inspire people to act on their creative passion and to participate in the arts. The word about Get Lit was out. After that, things started moving really fast. Many of the folks we’d reached out to got back to us and wanted to join Get Lit. Because of the articles, people began to start to ask to join the Get Lit Facebook page. 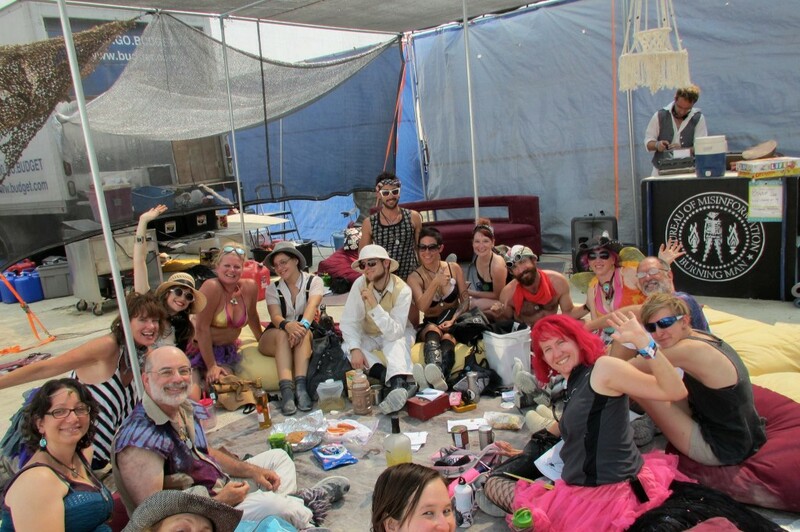 We asked everyone in the group to start talking about what they wanted to work on for Burning Man, and whether or not they needed space for their event, and suddenly collaborations were flying everywhere! A primer for young Burners was being written by several of us. Someone else was remixing our stories and blogs and binding the new writings into books to give away on the playa. I was designing a logo and having pendants made for anyone who wanted them. There were flash fiction events in the works, poems being penned, and even a camp bringing a bunch of awesome old typewriters to the burn! What and I took on the steering committee job, helping to match up collaborators, camps, and events while still working on preparing our own workshops to bring to Burning Man. Inspiration was everywhere, and it was all we could do to keep up with it! The closer we got to the burn, the more essential it became for What and I to be in the know regarding whose projects were a go, whose projects were being back-burnered until the next year, and where everyone was going to be on any given day. We did the best we could, and What put a ton of time into creating handy guides to all of the events, which she made available as a printable file for anyone who wanted one. And then we were out of time. Burning Man was. And Get Lit(erary) did. We had a meet and greet that was great even though it ended up being somewhat clandestine and hard to hear over the music at the Bureau of Misinformation. It was fabulous to finally sit face to face with the people we’d been collaborating with for the last couple of months, and get to hear about their writing projects and newly published works. Get Lit(erary) Meet and Greet! There were the planned workshops and events outlined in What’s Get Lit guide, but of course nobody attended as many as they intended…that’s just Burning Man. I heard a lot of reports from people who had “really wanted” to get to this or that Get Lit event they’d read about, but the distance between one event and the next was often a barrier. Distance creates opportunity for adventure, and most of us ended up getting waylaid moving from one place to the other. There were random convergences over the course of the week, too, and these were always sublime. One of my little moments of serendipity in the desert: randomly finding Spines unlit, in the dark, the first night I ventured out, with Matt Melnicki there to show me his work! And, regardless of planning or happenstance, literature was read, written, shared, and burned by a good many of us. But to the question, the one that started it all: Did we manage to create, or at least highlight, a literary culture at Burning Man? For myself, I believe the answer to be Yes. Perhaps it wasn’t on as large of a scale as we would have liked, but still, Yes. 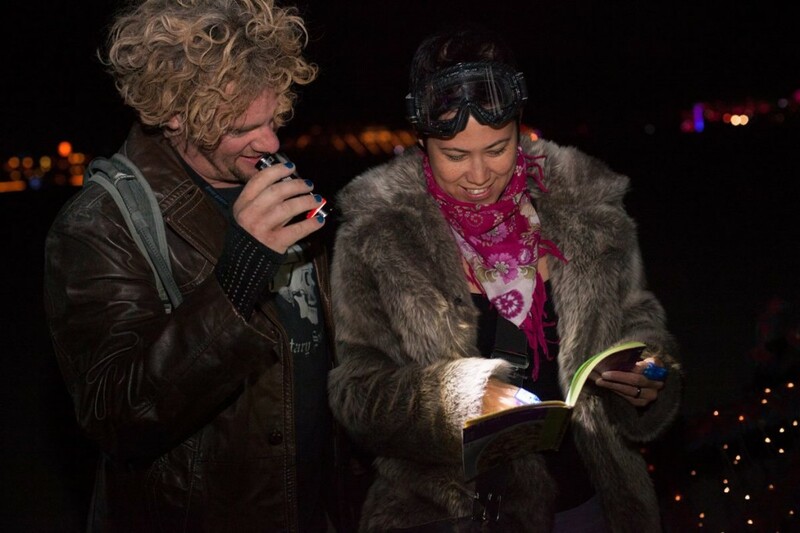 There is a literary culture at Burning Man. We didn’t start it by any means, but I think that what Get Lit(erary) did was unite us in a way that had not been done before, and maybe that’s what was needed in order to answer the question. Yes, there is a literary culture at Burning Man because we all agree that there is, and as a group we will continue to reach out to burning writers and readers, create new ways for burners to generate and interact with literature while on-playa and in the in-between times, and work to highlight the literary aspects of the event. What will be different in 2014? Well, for starters we’ve got the jump on the year, so rather than scrambling last-minute to pull everything together we have time to discuss our plans and really explore which ideas we want to put our energies into. We’ve also gained the experience of working as an (online) group to collaborate, which means we have a better idea of how each of us works, and what sorts of outcomes we might expect. In 2013 we also learned that the lack of a central space in which to gather together our literary compatriots was a major drawback. Having a central area to gather will be crucial for us in 2014, and it sounds like one of the camps we partnered with last year will be able to help us out. Get Lit(erary) at Burning Man is just one of many fires that a person can be drawn to out in the desert. For some of us, it’s a deadline, while for others it’s a challenge, or an invitation. Right now, so early in the year, it seems to me nothing more than a tiny spark that a few of us are blowing on, but I have a feeling that the closer we get to the summer months, the taller the flames will reach. How brightly it burns come the end of August is up to all of us to decide. This entry was posted in Burning Man. Bookmark the permalink.